Embroiderers' Association of Canada, Inc.: EAC Members in the Spotlight! This year I had the privilege of attending Creativ Festival in Toronto and teaching some classes on behalf of Embroiderers’ Association of Canada. Creativ Festival was celebrating their silver anniversary – 25 years. To honour such a large milestone, they held a Designer Style Challenge. Congratulations to four EAC members who won awards!! Following is information from the Creativ Festival webpage to describe this challenging contest. 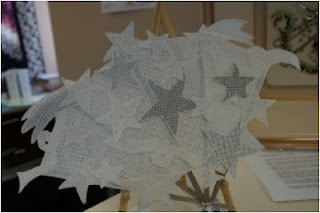 They described it at Canada's search for outstanding original designs - a mixed media challenge with awards of distinction. There were awards of over $20,000 in cash & prizes: 8 - $1,000 Cash Awards, Swarovski Crystal Trophies & more. 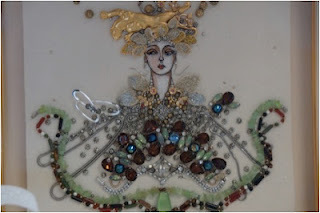 The Challenge was to create an original mixed media work of art. They were searching for the best in Canada. 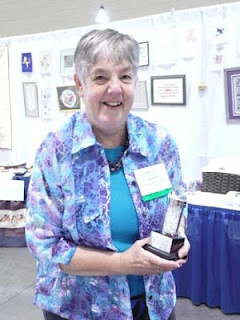 The theme was "Celebration" with a touch of silver for their 25th silver anniversary and 8 different categories: quilting, beadwork & jewellery design, needle art, knitting/crochet, fashion sewing & design, fibre art/surface design, paper art and upcycling. The Judging Criteria included inspiration and creativity, craftsmanship and quality, intricacy and complexity of the design, innovative use and diversity of materials and finishing. Creativ Festival hosted a gala evening where the winners of the Designer Style Challenge were announced and presented with prizes. In the Fibre Art / Surface Design, sponsored by H.A. Kidd and Company Limited www.hakidd.com, the entrants were required to create an original design made of textiles such as fabric, yarn and natural and/or synthetic fibres that are neither a fashion garment nor quilt with 3 layers - back, batting and top. The entries would include but are not limited to works of art, handbags, accessories, 3 dimensional pieces, pillows and other home décor items. This category included felted items that are not garments. 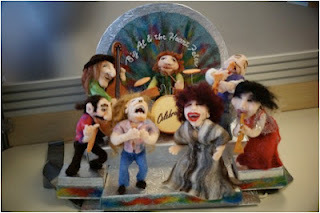 1st prize was awarded to our President, Joyce Gill from Cornwall, PEI for her entry named Big Al & the Heart Felts. What a spectacular piece of art! 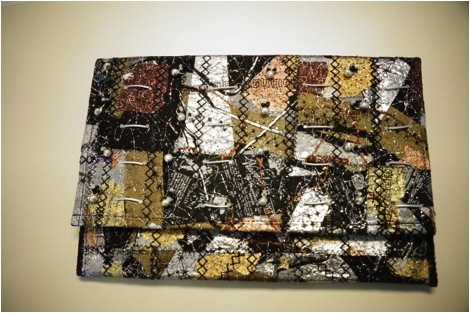 2nd prize was awarded to our Past President, Sue Thomas from Lakewood, ON for her piece - Foiled Again Clutch Purse. A truly elegant purse to accessorize for a “dress up” occasion. In the Needle Art category, sponsored by A Needle Pulling Thread magazine , the entrants were to create an original design stitched by hand (i.e. crewel, needle point, cross stitch, blackwork, etc. ), anything other than wearables or quilts and the finishing of the piece could be done by hand or machine. 3rd prize was awarded to Kim Beamish from Severn Bridge, ON for her piece - Celebration Fan. Beautiful design and beautiful stitchery! Also under the Needle Arts category, a Special Recognition Award was won by Marie-Renée Otis from Bai St. Paul, QC for her piece entitled The Weight of Wealth Framed Jewelled & Embroidered Face. A very stunning piece. What outstanding creations from our members! I was very proud to be part of the audience at the Gala and watch them receive these prestigious awards. Congratulations to these four ladies for accepting the challenge and being award winners. I hope that we can encourage each one of them to write something about their creation and/or creative process in a future edition. You ladies are an inspiration to us all. I would love to see the pieces on exhibit at Seminar 2013. Could we perhaps interest you ladies in bringing them? Congratulations to all of the winners! You all rock!